Home » Painting and Decorating Tips » 2015 » November » What Floor Paint to Use? My goal is to help prevent such problems occurring, to give a list of caution points or questions to ask and to ensure the right preparation is done, the correct coating is selected and that it is correctly applied. As is true of many paints, the application is straightforward once the correct preparation and product selection has been made. • What sort or traffic will the floor experience? Is it foot and light hand truck or vehicular (e.g. regular, fork truck)? • How long must the coating last? What is expected of it? • What colour is required? • Is a slip resistant finish desirable or essential? • Are solvents and oil spilt onto the surface? Acids or Alkalis? • Is it regularly washed down and what is it washed with – just water or cleaning solvents? Single pack air drying paints are the most commonly used. They consist of single pack/ tin which is stirred, then applied and dries by solvent evaporation followed by further curing over several days. They are easy to apply to a correctly prepared surface but vary in quality and durability. Most are oil based and thinned with white spirit. Of increasing significance are single pack water based air drying products which dry faster given good warm, dry and well ventilated conditions. Specialist anti-slip versions are available when an aggregate has been carefully formulated to dry within the paint film A step up from single pack water based or white spirit thinned coatings are Rubberised floor paints which are based on modified chlorinated rubber resins. Such products require slightly more skilled and careful application but have better resistance to water, solvents and acids than the white spirit thinned alternative and can be more durable than the water based single pack alternatives. 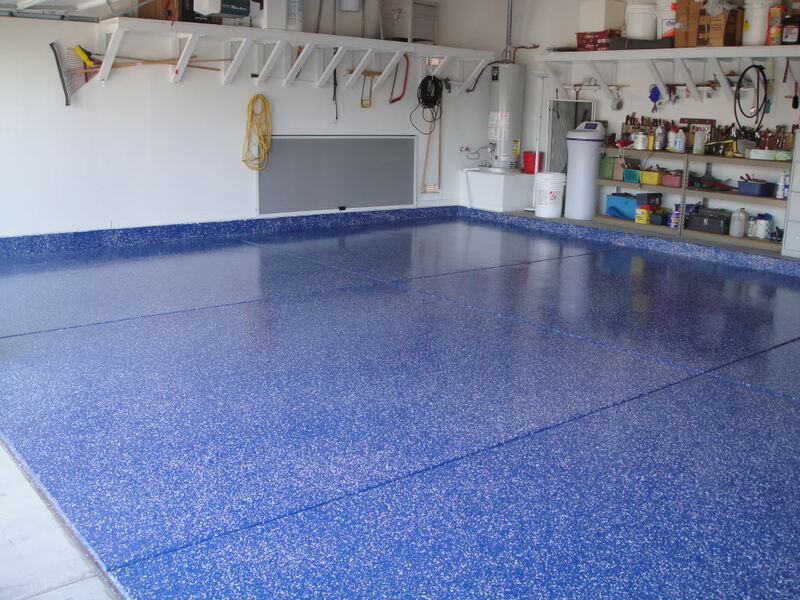 Two pack epoxy (high build) which is commonly used in industrial and commercial areas. Low organic solvent content and high film builds can be obtained which are suitable for fork lift and truck traffic. Moisture cured and two pack polyurethanes which are generally more resistant to acids and have excellent performance characteristics. To sum up: Single pack products are cheaper, easy to use and suitable for domestic, foot and light truck use. Two pack products are more expensive, considerably more durable but require more careful application. Generally speaking commercial and professional application is advisable. A site visit by the manufacturer is often very beneficial to ensure the correct product is selected when two pack products are required. Preparation “The floor must be clean, dry and free from wax, oil and grease”. That’s what the instructions say on most tins of floor paint. What is clean, what is dry? I could list figures and specifications but the list would be a long one. What you require is some straight forward guideline to use. It is true to say that the ideal preparation of a floor should be the same, no matter which type of product is used but in practice, where cost and time are involved, preparation becomes more and more important when the more sophisticated and expensive coatings are used, as a failure of these coatings would result in considerably increased costs. • The majority of floors are coated with concrete. The concrete must be “dry” and that means it should be at least 3 months old or have a moisture content of less 14%. • Power floated, smooth, or granolithic floors must be etched prior to painting. This can be done chemically using “Acid Etch” type products or mechanically with industrial abrading machines or shot blasting machines. • Residual laitance and salts brought to the surface of a concrete floor by the drying process must be removed. This can be done using “Acid Etch” type products or light short blasting (don’t be put off by shot blasting especially when two pack products are used). The process using the correct equipment in professional hands is not as messy or expensive as it sounds. A general guide price is about £1 per m² – could be less or more depending on the job and there are good specialist contractors who can provide this service. This process will both etch the floor and remove laitance leaving a clean and prepared surface suitable for painting. • Remove grease and oil using a suitable degreaser. In extreme cases where a floor is old and has years of oil and solvents soaked into it, it may be best to turn to a specialist. • Check the compatibility of the proposed coating with existing paint. If in any doubt the previous coating will have to be removed. For instance, over coating a single pack floor paint with a two pack product will often result in the two pack coating pulling up or breaking the bond between the floor and the original paint. The result will be the failure of the whole floor paint system; it will all flake off. It is important to check for any reaction between one single pack product from another. For instance you cannot overcoat white spirit thinned single pack coating with a more sophisticated rubberised single pack: one will react with the other and result in the failure of the system although most single pack products are compatible. A simple check is to find out if the thinners is white spirit or not. If it is a solvent stronger than white spirit you may have a problem. • Ensure the concrete does not have pits or cracks where the paint can form pools. This will result in drying problems when a skin will form over the pool and the paint underneath will stay wet for a long time. The result will be patches of undried paint. Fill any holes and do any repairs necessary to ensure a level surface. • Following from the previous point, do not apply the paint too thickly as this will again impair the drying process. Read the coverage guide on the instructions. • Wooden floors should be sanded smooth . In many cases where grained floor boards are painted, the hard wood in the grains has resisted wear more than the other areas. This leaves an uneven profile on the floor which results in the paint flowing into the low areas which result in a thick film in some areas which will take a long time to dry. • Always thoroughly stir the paint – unless the tin gives other instructions. • Slow speed mechanical stirrers such as a variable speed drill and paint paddles should be used when stirring most products and definitely when mixing two pack coatings. • Ensure the correct conditions of temperature, ventilation and humidity exist both during and after the paint has been applied. • Apply the coating by the selected method (brush, roller or sometimes spray) to the correct film thickness. • In many cases a thinned coat on concrete is required as a first coat. • Work in a systematic manner especially when using two pack products (Remember that they have a limited “pot life”. A tea break at the wrong time could be disastrous). Ensure you stick to the manufacturers overcoat times. • Most floor coatings will dry in 12 to 24 hours but their full cure and hence full performance will be achieved over several days. Check this carefully and inform the client to ensure they are aware. We have all heard statements like “We can’t stop working” or “I want the whole job done tomorrow”, “No, we can’t leave the windows open for ventilation” and “What! Leave the heating on all weekend with the doors open! Impossible”. The main thing is that if stringent controls and difficult circumstances exist when painting a floor then the customer needs to be informed of the problems that may occur and how it will affect the coatings long term performance. There’s no point in buying the most expensive durable, chemical resistant coating if you are not given time to prepare the surface and apply the product properly.